In the gallery of Australian art at Federation Square hangs John Brack’s iconic portrait of Melbourne in the 1950s — Collins Street, 5pm. This painting of the ritual march home from work to the suburbs depicts a city full of people and buildings, yet monochromatic and flat. It has become iconic not only because it captured a mid-20th-century conformity, but also because it stood for the loss of an intensive urbanity that had flourished in the “Marvellous Melbourne” of the late 19th century. While this era came to a crashing end with the 1890s depression, Melbourne did not fall into decline so much as into conformity and staidness. Through the early decades of the 20th century and two world wars Melbourne remained a major city, but the focus of its development shifted to the suburbs. Retail activity in the central city declined as suburban shopping malls burgeoned and planners surrendered the city to cars and parking. A substantial architectural heritage was threatened with demolition for a stream of high-rise modernist projects — and indeed much was lost. The central city’s residential population was negligible and Melbourne became a rather dull place that closed on evenings and weekends. While many challenges remain, central Melbourne’s transformation since the 1980s is now a global success story. This is not one story but many: the design of new architecture and public space reclaimed from cars. From turning its back on the water Melbourne has embraced the river and become a waterfront city. Residents have become a vital part of the city centre, while the inner suburbs have become more dense, diverse and desirable. The city has grown greener — literally, environmentally and politically. The universities have become internationalised and their campuses urbanised. Laneways that were once filled with garbage are now filled with hip bars, housing and street art. Always an urbane city, Melbourne is emerging as a city with a depth of character and urban buzz that is palpable, ineffable and unfinished. SO HOW DID THE TRANSFORMATION HAPPEN? This is not a story of heroic leadership nor of grand projects so much as many stories of many agents and projects working together. While there have been important forms of leadership and governance and significant formal transformations, what really counts are the slow incremental transformations over the long term. One key problem with the central city of the 1980s was that almost nobody lived there. Beginning with the Postcode 3000 program in the 1990s, the demand for residential accommodation has grown so that the challenge is now one of preventing residential development from damaging the city and displacing other uses. The concept of a central business district has been relegated to history as the city becomes a place where people live, work, shop and play everywhere; formerly monofunctional zones become diversified; the raw ingredients of a city blend into a rich curry. Another transformation has been in the expansion and pedestrianisation of public space. While one can point to new open spaces such as Federation Square and Southbank, much of this expansion is also incremental. Reclaiming public space from the car mostly happens one parking space or traffic lane at a time. This is a slow cycle: less available parking induces people to move from cars to public transport; this leads in turn to more pedestrian life and a demand for more public space, which is further enabled by fewer cars. One of the most visible of the incremental changes has been the overall increase in density – whether measured as streetlife, residents, jobs or building bulk. Density is one of the most difficult urban properties to manage. Read more: Urban density matters – but what does it mean? On the one hand density is good: it brings everything closer together and gives us walkable access to more people and places. Yet density can also kill the urban buzz. Hyper-dense projects that damage adjacent public spaces are blighting some parts of central Melbourne. It is no accident that the most vibrant of laneways in central Melbourne are in areas with buildings less than 10-12 storeys high. The threat of over-development to the quality of public space remains a key challenge. The transformation of central city laneways from derelict and dangerous wastelands to global tourist attractions has also been incremental. Melbourne’s laneways emerged during the 19th century as adaptations to the formal grid. The blocks and plots were initially far too large, and the need for subdivisions and shortcuts led incrementally to the intricate network we have inherited. In this regard, Melbourne was lucky since so much of its character is now embodied in this intersection of the formal grid with the irregularity of the laneways. The potential of the laneways has long been recognised, especially by the young and the creative industries. The laneway transformations are due more to enabling those activities to flourish than to the various upgrading projects that often follow. The danger now is that as lanes become gentrified and “branded” for global consumption, the street art becomes curated and the real urban life moves on. Urban design within a complex city can be understood as a kind of “urban choreography”, not a micromanagement of the form or the life of the city, but a practice of framing, shepherding, enabling and constraining. How to achieve a balance between over-regulation, which paralyses creative and productive forces, and under-regulation, which unleashes over-development and privatisation that can kill urban life? How to enable markets to flourish while controlling over-development? Good cities allow elements of disorder, spontaneity, informality and unpredictability. Different people, practices and buildings cluster in cities to form alliances; but different values, built forms and activities also intersect and contradict, and make a richer society because of that. We are all agents in the choreography of urban life. A major challenge that remains in Melbourne lies in developing a better relationship between the city and the state. 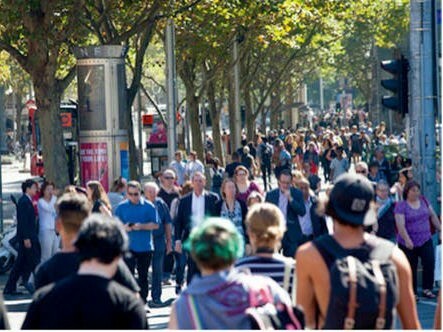 In the 1980s the state government played a key role in initiating positive change and in collaborating with Melbourne City Council on a range of urban design transformations – the Southbank strategy and laneway revitalisations, for example. Many Melburnians will remember the event known as the Greening of Swanston Street in 1985 when the state (with Evan Walker as planning minister and David Yencken as head of department) paved the civic axis with grass and threw a street party that enlarged our imagination of what was possible. Urban design within the City of Melbourne has flourished ever since, but state intervention in the central city (regardless of the party in power) has often been ill-informed, authoritarian and damaging. The recent decision to allow Apple to rebrand Federation Square, together with the anti-democratic manner in which it was implemented, is but one example. Any understanding of central Melbourne today is also the basis for the kind of city it might become over the next 30 years. If we compare the many past visions for central Melbourne against the city that has actually emerged, again we find that incremental change is the norm of urban transformation. Grand visions may “stir men‘s blood”, as Burnham famously put it, but are rarely realised in full; the real city has generally emerged as more complex and more interesting. While images of idealised urban futures capture the public imagination, the deeper task is one of understanding the complexity of the city, the forces that drive it, the possible outcomes and the interventions that are necessary to realise them. While there is always a place for imaginative new projects and instant transformations, the key task of inventing the future is that of imaginative adaptation of the existing city. While most change is incremental, in aggregate it is transformational. The palpable buzz that distinguishes central Melbourne from all other Australian cities, indeed most new world cities, did not emerge overnight. And it is not finished yet. Watch this space. This article is an edited excerpt from Urban Choreography: Central Melbourne 1985— (MUP 2018), edited by Kim Dovey, Rob Adams and Ronald Jones.